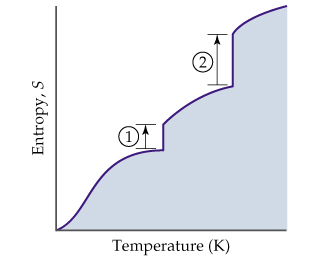 Solution: The diagram shows the variation in entropy with temperature for a substance that is a gas at the highest temperature shown.Why is the entropy change for process 2 larger than that for process 1? The diagram shows the variation in entropy with temperature for a substance that is a gas at the highest temperature shown. Why is the entropy change for process 2 larger than that for process 1?